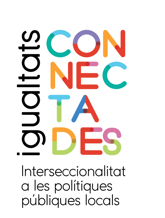 In the blog of Trànsit Projectes this article (available only in Spanish) has been published that talks about the project Igualtats Connectades. The days leading up to the March 8 feminist strike, full of necessary conversations about gender equality, are a great opportunity to revive the debate on the meanings of this movement, as well as to reflect on the origins that underpin it. […] Trànsit Projectes, proposes the approach to a term that seems to claim perfectly one of the most inclusive notions with which feminist theory usually works, and does so through a project in process: Igualtats Connectades.